Alfred 2.0 workflow to search and create notes in Evernote. You can use ent (search in titles only) or enr (search in reminders) or entodo (search to-do notes) or enrec (search notes updated within a week) or enu (search notes with a source URL) instead of ens. Note that, if you want to select a notebook and/or tags, the query goes after the colon sign as seen above. Note that Alfred Fallback Search is also supported (you have to add it in Alfred 2 Preferences>Features>Default Results, then click Setup fallback results button). 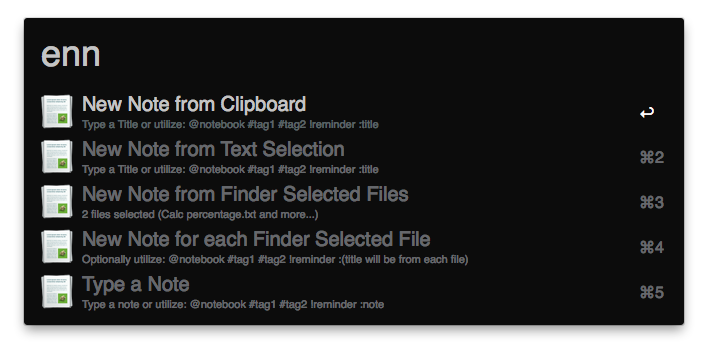 From file(s) selected in Finder app: you can create one note with files or one note for each selected files. Alfred File Browser also supported.